“Yeah, you could be spending that time writing or editing.” Cleaning and general maintenance are necessary elements of any physical collection, and while sorting through my NES collection, I decided that now is the best time to do this right! It’s not that I have the downtime for this. My thinking was if I don’t find value in maintaining this collection now, I should sell while the market’s good. Fortunately, I found a meditative value. The germinative seed was from Layer Cake. In the movie, one character explains to another the meditative qualities of taking a gun apart and putting it back together. For me, the primary appeal of owning anything is, likewise, interacting with it. Observing something like an action figure from different angles, posing it, and arranging it for lightbox photography is nice. The same for videogames: the real question here was overcoming the pain of physically owning and lugging around sometimes unreliable objects when emulation, cough-cough, excuse me, I meant to say paid digital distribution, is much easier. Where’s the benefit in owning something with upkeep? When life is distracting you with too many things – this needs to get done, you only have so much time to do that, and yet you don’t feel like doing any of it – it’s great, sometimes, to have something easy to do. While there are cleaning devices that let you dunk a cartridge cleaner in propan-2-ol, 70% will do, in a hurry, you might as well just pay someone to maintain parts of your collection. Why outsource the process? Just like any process, there’s value to be had in grinding through the tedious process of properly cleaning cartridges: dipping a clean cotton swab or paper towel in isopropyl alcohol, cleaning the pins, the inside edges of the cartridge, then the outside. It’s the same feeling as level-grinding in a particular level. To get the Sword of Kings in EarthBound, the best and only weapon for one of your four characters, you have to repeatedly face the same enemies in a particular part of the game for between minutes and hours. It is infamously the hardest challenge in the game. It’s not a matter of skill or luck, but resolve. How many hours will you spend grinding away at this challenge before you give up? I spent 8. By the end of that session, I had thoroughly escaped my reality and entered into this videogame world’s logic, wherein I had mastered a system for optimizing my encounter rates with the enemies that would leave behind this gorgeous goodie. If I had a 1-in-128 chance (or 0.0078125%) of the item dropping, I was going to do anything I could to learn the best shortcuts to make that happen. Pour the isopropyl alcohol into the pan. Dab one cotton swab in your “isopropyl” pan. Blot the excess off on a dry spot of the pan. Rub one side of the pins with light pressure. I’ll usually go from the bottom to top. Turn the swab slightly as you move along. 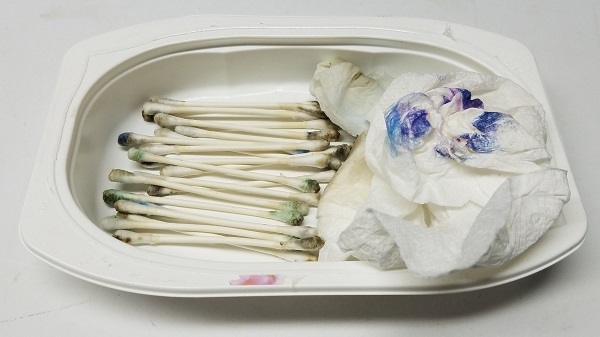 How dirty is the swab? Clean around inside the cartridge. Continue cleaning on the outside. Turn over the swab or throw it away. Proceed to step 7 once the swab is not dirty after cleaning the pins, inside of the cartridge, and outside of the cartridge. Leave the cleaned cartridge standing upright to dry. If the cartridge does not play on the first go, return to step 2. If the cartridge does play, you’re done! That was good fun and all. Why bother with doing something like this when it’s, frankly, easier to play the game digitally? Why not just boot up your console of choice, find the game, interact with it [click on it, press a button, et cetera], and press play? While there is something to be said for the process of physically interacting with something like a record or videogame, in that you might honor the process more – such as, by scheduling time on your calendar, not multi-tasking while listening to the album or playing the videogame, through which you perhaps feel a certain kinship with the materialistic object – my thoughts are a little different. Cleaning these NES cartridges is a great way to clear your mind. Whether it’s grinding to get to the next level or to get a rare drop, gun stripping to better acquaint yourself with the intricacies of your hobby, or (the inspiration for this essay) cutting and punching pin-back buttons for that Keyboard Kommander presentation while brainstorming ideas for its story mode, the point isn’t about short-term pleasures. It might be easier to outsource this work, but we do these tedious things for long-term success. Besides, menial repetitive activities can be relaxing. It’s more fun having achieved the next level or attaining the rare drop, knowing the tool you’ve worked on is in optimal shape, or having a tangible object that did not exist before. Through all these and other processes, we figure out our own optimal processes, maybe our minds drift into new areas, or our overly-taxed minds (in this Distracted Generation that is in a go-go-go state of overstimulation, 24x7x365) can go into standby mode for a few minutes. But, is owning and maintaining a materialistic collection truly meditative? Not directly. You have to decide if it is or not. If it’s not, clean up your space and sell off the collection! Quotes:  Friend to the website, Ryan. Photo: One hour’s worth of cleaning.